This article is about the boss Mouser. For the character from Mario Party Advance, see Mouser (Mario Party Advance). For the similarly named recurring species in Yoshi and Paper Mario titles, see Little Mouser. Not to be confused with Meowser. 1.3.1 "Butch Mario & the Luigi Kid"
1.3.2 "Rolling Down the River"
1.3.3 "The Great BMX Race"
1.3.4 "Stars in Their Eyes"
1.4.1 "A Mouser in the Houser"
Mouser made his debut in Yume Kōjō: Doki Doki Panic. Mouser helped Wart to invade the secret world of a storybook with his bombs. He is fought three times in the game: in World 1-3, World 3-3 and World 5-3, with a powerful white Mouser with red shoes and gloves exclusively appearing in the latter level, taking seven hits to defeat. In Super Mario Bros. 2, Mouser appears twice, one, with pink ears and shoes, in World 1-3 and the other, with green ears and shoes, in World 3-3 (The differing colors are only in the NES version.). The fight in World 5-3 of Yume Kōjō: Doki Doki Panic was deemed too difficult, and was replaced by Clawgrip. In battle, Mouser throws bombs at the player, which will explode after a short time. In order to injure Mouser, players need to grab one of these bombs and throw them back at him so that it explodes near or on the rodent; doing this several times (He takes three hits in World 1-3, and five in World 3-3.) will defeat him. In Super Mario Advance, a new boss, Robirdo, replaced his second battle in World 3, which itself replaced Tryclyde's second battle in World 6; Tryclyde remained the boss of World 2. Like the main cast and the various bosses, he was given voice acting. His lines were performed by Charles Martinet, who voiced him with a snide tone. Upon defeat, Mouser can be heard exclaiming, "No way!" In BS Super Mario USA, Mouser, Birdo and Wart have returned to Subcon to invade it again. Mouser is found in World 1-3 as the main boss of the world. He is no different than in the original game. However, like Wart and the Birdos, he could cast his own magic spell; such as turning enemies and objects into bombs, and throwing giant bombs out of nowhere. Mouser in his regular appearance of The Super Mario Bros. Super Show!. Mouser is a prominent character in The Super Mario Bros. Super Show!. Unlike the in-game appearance, Mouser works for King Koopa and is second-in-command. Like his boss King Koopa, Mouser had many aliases that go with the theme of the episode. In the show, he was voiced by John Stocker, the same person who voiced Toad. Mouser appears in 23 episodes, albeit with speaking roles in only 21. Mouser (known in the episode as Sheriff Mouser) first appears when Mario, Luigi, and Toad walk up a hill. Mouser has his pack ready to arrest the Mario Bros. Mario and his friends run away from Mouser and his team, and they pursue after Mario and his friends. Mario and his friends soon find themselves in a cliff, with a crashing waterfall below and logs falling down the waterfall. Shortly after Mouser finds them trapped, Mario and his friends successfully jumps across the waterfall using the logs, leaving Mouser. Mouser attempts to jump by claiming, "If they can do it, so can I! ", hesitating, and then nervously saying that his pack can go first. After his pack falls into the waterfall after a failed attempt, Mouser starts crying. When Mouser reports to King Koopa that the "pesky plumbers" have gotten away, King Koopa gets angry, starts insulting Mouser, and threatens to lock Mouser up instead if Mouser doesn't catch Mario and his friends. Mouser then nervously said that he'll get every bounty hunter available to catch Mario and his friends. After Mario and his friends go to the mine where Princess Toadstool is trapped, Mouser surrounds them with his pack and tells them to "reach for the sky." A Tweeter then gets into an argument with Mouser, and Mario and his friends quickly run away. Mouser then throws a bomb at the mine, and as a result, a boulder chases Mario and his friends. When Mario and his friends get exhausted, they fall for a trap and get locked up. Mario and Luigi hatch a plan, and they decide to trick Mouser by begging for water. Mouser brings water, only to drink it in front of them. Mario and Luigi then play a game of Patty Cake and Mouser exclaims, "Hey! What are you loonies up to?" Mario knocks Mouser's hat off, in which Mouser is then angry. Toad sneaks inside the hat, and a moment afterwards Mouser grabs the hat and puts it back on, warning the Mario Bros. not to do that again, unaware of Toad no longer being in the cell. Mouser then arrives at a bar for a drink. Toad sneaks from the hat and steals Mouser's bombs, first bombing the bar and then the jail in which Mario and Luigi are locked up in. When Mouser notices that Mario and his friends are free, he orders his pack of Koopa Troopas to stop them. Mario and Luigi run away to the mine where Princess Toadstool is trapped, and Mouser lets King Koopa do the rest of the work. However, King Koopa fails to capture the Mario Bros., and Princess Toadstool is freed. Mouser first appears in this episode (as First Mate Mouser), coming out of King Koopa's ship and reporting to King Koopa that there are no stowaways. King Koopa gets angry at Mouser, calling him a fool, and then grabs and shoves Mouser aside. He then steps over Mouser while Mouser glares at him. Mouser is next seen looking through a telescope to see any trace of the Mario Bros. coming back (the Mario Bros. jumped out of the ship after they were chased by King Koopa's minions). Mouser then shouts to King Koopa about seeing something in the telescope. At first, King Koopa objects by telling Mouser not to interrupt, but when Mouser continues to alert King Koopa, King Koopa grabs it, he is horrified to see Mark Twang's Ding Bell, his competition of the boat race, coming at full speed at his ship, the Sinister Star. He then sees the Mario Bros. who made the ship faster, and he gets angry, throws the telescope on the ground, and steps on it. King Koopa instructs Mouser to bring him the Black Pit Bob-Omb. Mouser then gets surprised by this order, but since King Koopa is the number one authority, Mouser brings King Koopa the Bob-Omb. King Koopa then throws the Bob-Omb at the water behind his boat, and it creates a giant hole to stop the Ding Bell from crossing that area of the river. Mouser is next seen when King Koopa again sees the Ding Bell after it crossed the pit. He throws his telescope at Mouser, who appears bored, and then steps on the telescope again. Mario and Luigi then go on the ship, and with the help of Mark Twang and the Mouth of the River, Mario and his friends crash King Koopa's ship onto sand, which makes King Koopa and his crew lose the race. Mouser first appears right when Mario and Luigi are about to start the race to prevent Toad from burning caused by a Fryguy. Mouser starts taunting the Mario Bros. by saying, "Looks like you forgot your training wheels, sewer sap," and then starts laughing, along with Tryclyde and a Koopa Troopa, and he falls off his motorbike. Right when he gets up, Mario and Luigi leaves them behind by starting the race. Team Koopa then pursues the Mario Bros., with King Koopa aiding them through use of a helmet that can transfer King Koopa's orders directly to Team Koopa. Team Koopa then sees Toadstool and Toad in the road and capture them. After the Mario Bros. stop to have a snack, Team Koopa passes them quickly, making them spin and fall off their bike, which slows them down. Team Koopa then drives up a steep incline, while the Mario Bros. follow them. Team Koopa then drives downhill, and the Mario Bros. hit a rock and fall down a cliff. Team Koopa thinks that it is the last of them, and Mouser exclaims, "Poor plumbers went POW!" Shortly after exclaiming this, the Mario Bros. drives past them and Mario says, "Sorry we can't stay and chat with you goons, but we have a race to win!" Team Koopa then gets bewildered by this. While racing, Team Koopa catches up to the Mario Bros. The Mario Bros. throws tomato sauce on the road, and the Koopa Troopa and Tryclyde gets caught in it, and they lose control, losing speed. Mouser avoids this and throws Bob-Ombs at the Mario Bros. which they avoid. Mouser gets caught in the smoke, coughs, and loses speed. When the Koopa Troopa throws a rock, the Mario Bros. avoids it, but gets their wheels punctured by the spikes of the shattered rock. Mouser and his team surrounds the Mario Bros., and Mouser is ready with his Bob-Omb to annihilate the Mario Bros. The Mario Bros. then spin in circles, making a lot of dust in to obscure Team Koopa's view and makes them cough, while the Mario Bros runs away to a vegetable patch. Team Koopa tries to follow them, but Mario and Luigi successfully throws vegetables at Team Koopa, first hitting Mouser with a large zucchini, then the rest of the team with another horde of vegetables. Team Koopa, in dismay and in pain with their destroyed karts, then walk away from the Mario Bros., while the Mario Bros. wave them and said, "Hey, Team Koopa! At least you can say goodbye!" In planet Quirk, Mouser (known under the alias, Astro Mouser) first throws a Bob-Omb at two Quirks and he starts ordering them to drag the load they are carrying a little faster. Then, Mouser hears a disturbance in the sky. As the two Quirks run away, a spaceship crashes on Mouser. Mario's spaceship, after suffering through an array of meteors, crashes on Mouser in the planet. The Quirks come to thank Mario and his friends for crashing on Mouser. Mario and his friends get shocked by the mention of Mouser and Mouser slides out of the ship, smashed. Mouser then growls at Mario and throws his smashed Bob-Ombs at him, while Mario and his friends escape with the Quirks on a raft. Mouser pursues Mario and his friends and throws a Bob-Omb in the river, which springs a leak on the raft. Mario soon fixes the leak, which then propels the crew on the raft away from Mouser. Mouser then alerts King Koopa about Mario and his friends entering the planet. Mouser does not get seen later in the episode. After a long series of absences, Mouser finally returns. He is first seen in Car Land when State Troopa had Mario and co. surrounded. Next, Mouser joins King Koopa to go to the Rebel Fort, but then the car is flipped. King Koopa tells Mouser that he a mouse-brain because he spent all the gold coin he wasted for his pack's driver's ed classes. Mouser then alerts King Koopa that the Marios escaped. He then ambushes the Marios, but Mario, Luigi, and Toad bump into a truck. He then brings the Thunder Birdo and lets the egg hit the fort, producing a large amount of smoke. Mouser, who wonders what happened to the Mario and co., suddenly gets ambushed by Mario and Princess Toadstool, who is riding a truck with spaghetti sauce, Luigi, who is riding a helicopter, and Toad Warrior. He again rides the car with the big Birdo, but the car get exploded by Toadstool, who threw the bag of bombs into the big Birdo. A Bob-Omb is thrown at Mouser, causing him to then disappear, never to be seen for the rest of the episode. In the Nintendo Comics System, Mouser is said to have been the leader of similar looking rats called Mice, before defecting to King Koopa. In the Nintendo Comics System issue "A Mouser in the Houser", it is revealed that the Mice once had a prosperous society, having dug the Transport Tube system and hidden all the treasures they found in it. Eventually, the society of the Mice began to crumble when their king, Mouser, abandoned them and joined Bowser. Mouser is one cool disc jockey! His morning show is a big hit on the radio. Everyone loves "The Mouser in the Morning Show." Everyone except for Mario the sound engineer. "I think I'll go get a job at a library!" says Mario. "I need some peace and quiet. That Mouser plays his music too loud in the studio." Mouser appears as a grab-type, primary spirit in Super Smash Bros. Ultimate. 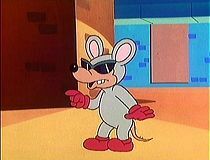 Mouser, like the rest of his species, is an anthropomorphic mouse that wears sunglasses that covers his eyes in most cases. When his eyes aren't covered, it is shown to be a white eye with a black pupil. He has gray fur, pink ears, a fur-less snout with a full set of teeth, and a fur-less tail. In Mouser's normal appearance, he lacks clothing, except for red gloves, red shoes and his sunglasses. Mouser does take on aliases, like King Koopa, where he wears an outfit to match the theme of the episode and he gets mentioned by a title, such as First Mate Mouser. In the show, Mouser has a Swiss accent, which is indicated by saying "zat" instead of "that" and other phrases where it is clearly defined. There are also references to his love of Swiss cheese. In the cartoons, Mouser, like his boss, King Koopa, is an antagonist of Mario and his friends and he will do anything he can to capture them. Mouser also likes to use bombs as his primary form of attack. Even though he is second-in-command, his pack members still obey him, as seen in "Butch Mario & the Luigi Kid." Mouser, however, does laugh at King Koopa when something embarrassing happens to him, as demonstrated in the episode, "The Adventures of Sherlock Mario" when Herlock Solmes recalls King Koopa's embarrassing memories of his past, though he is still afraid when King Koopa threatens or gets angry at him. Don Churuge Don: Spanish word for "sir". Churuge: From chū, rat squeaking sound. Squittix (Super Mario All-Stars Limited Edition instruction booklet) From topo (mouse) and the male pejorative suffix -astro. The episode Quest for Pizza introduces Mousersaurus Rex, a T-Rex-like dinosaur that looks like Mouser. In "Butch Mario & the Luigi Kid" and "Rolling Down the River", Mouser's voice was high-pitched. In the other episodes, his voice was low-pitched. In "The Unzappables", Mouser mentions cheese a few times. He even said that the password for the Koopa Klub is "cheese balls". In some episodes, Mouser usually battles Toad, which might be reference to the same person voicing them. ↑ "It is a bomber of bad dreams that destroys good dreams. It is proud and it doesn't believe that it is just a mouse." - Super Mario Bros. 2 instruction booklet, page 27 (Mouser description). ↑ Yume Kōjō: Doki Doki Panic instruction booklet, page 35.